piCture pOlish Blog Fest 2013! Celebrating the Year of the Blogger! Each participant has been sent 3 PP colours, and instructed to create some nail art using only those colours (black and white polish and decoration is allowed, so long as it doesn't overshadow the PP shades!) We've also been asked to write a tutorial for our finished designs. The shades I've been given are Peaches 'n Cream, Sky, and Malt Teaser. They have quite a retro feel to them when used together! So, now that I've explained what's going on, I'll show you my entry. I umm'd and ahh'd over this for quite a while and tried lots of different designs, but this is the one I ended up liking the most. 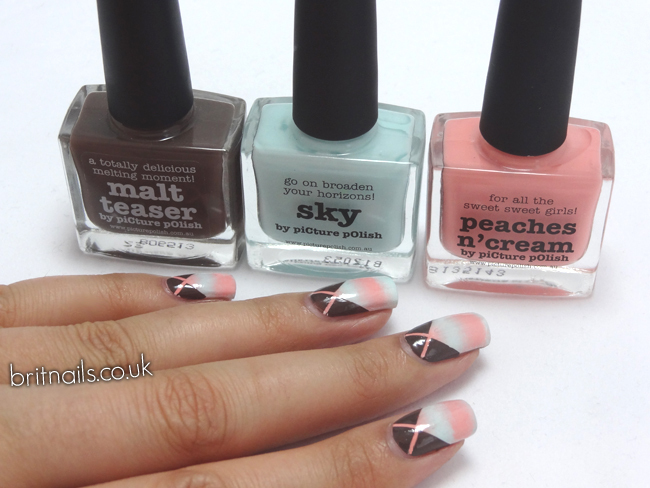 I think it's in keeping with the retro feel of the combined colours and the simple style I prefer for nail art. It also marries together my love for gradients and striping tape manicures! And here is the tutorial for the design. I hope it's helpful! 1. Start by painting your nails white. 3. Sponge it onto your nail using a dabbing motion, moving the sponge slightly up and down to blend the colours together. I've done two coats to make the colours stand out a bit more. 4. Apply a coat of your quick dry top coat. This will smooth out the gradient and dry your nails fast so you can use striping tape without ruining them. 5. Take 2 strips of your tape and place on your nail in a kriss kross shape, using your tweezers for precision. Make sure the tape is flat on your nail so no polish can escape underneath it. 6. Using Malt Teaser (how much does it look like melted chocolate?!) carefully paint over the tape, being sure to not go over the lines. 7. Using your tweezers, remove the tape immediately and carefully. Make sure you remember what piece of tape you stuck down first, so you can pull them off in reverse order! Have a little clean up around your nails and you're done. piCture pOlish can be purchased direct from picturepolish.com.au (check their shipping page for postage costs and info) and there are some great everyday deals available. You can also look at their international network page to see where they stock in your country! In the UK, you can find them at Sally Magpies and Rainbow Connection. Lovely way to get the colours to work together. Really pretty. so sweet and well think ! I'm a huge fan of your mani!!!! you used the colors so well and everything looks so perfect!! great job!! Ahhh so outstanding! These shades are gorgeous together! This is so interesting and beautiful! OMG I love this nail look! I want to recreate it! Love this! I want to copy this for a future Copy Caturday post! It's just so elegant and lovely. I would love to see it re-created! Thank you for great tutorial! Love this idea! Love the way you put these colours together & the gradient stripes are such a cool idea! Hi! I love your nail art, it makes really pretty on your nails (they are big and beautiful, wow!). You make pretty pictures. :) I also participated in the Blog Fest, I discovered a lot of blog is great! Guest post at The Nailasaurus!